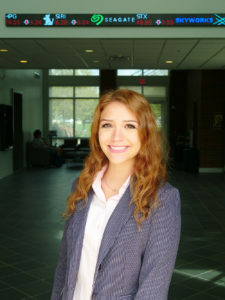 Bailey Martinez, a master of accountancy student in Louisiana Tech University’s College of Business, was recently awarded a $10,000 scholarship by the Public Company Accounting Oversight Board (PCAOB) intended to encourage outstanding accounting students to pursue careers in audit. The scholarship is awarded to one student at 332 colleges and universities who is excellent in his or her accounting degree program and has been nominated by a professor or by the school. Martinez was nominated by KPMG Endowed Professor David Herda, Ph.D. Originally from Austin, Texas, Martinez graduated from Louisiana Tech in August 2018 with a bachelor’s degree in accounting and is currently pursuing her master of accountancy degree. During her time as an undergraduate, Martinez served as president of Beta Alpha Psi, and completed an audit internship in Dallas, Texas, with Deloitte. Martinez has accepted a full-time position as auditor with Deloitte and will join their Dallas office upon graduation. For more information about the PCAOB scholarship, visit pcaobus.org.